Manager Pep Guardiola has sent his "thoughts and best wishes" to the Manchester City fan who was assaulted following the Champions League win over Schalke in Germany on Wednesday. 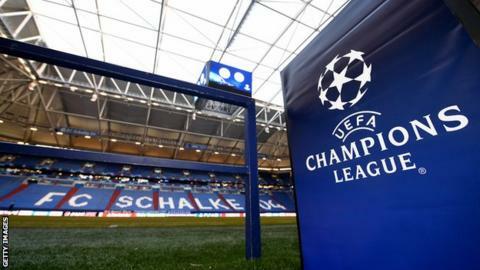 The 32-year-old man is in a medically induced coma in hospital after suffering a serious head injury in a violent confrontation with two Schalke supporters inside the Veltins Arena. He had travelled with his parents and sister, who remain in Germany. Guardiola said the news was "tough". "We knew the terrible news after the game. Our thoughts and best wishes are with them," the Spaniard said. "Unfortunately, this has happened. I hope the authorities can sort it out and the fan can recover as soon as possible." Nicolas Otamendi was sent off for the visitors but further City goals from Leroy Sane and Raheem Sterling secured victory.